One of the frequently asked questions about domain emails is will your existing email accounts and messages be transferred over to Doteasy as well. Unfortunately, just like your website, your domain email accounts and messages are not transferred to your Doteasy account. When you change the DNS settings of your domain name, you’re simply redirecting your website and email traffic to your account on the Doteasy server. So, the first step you need to do is setup your email accounts on your Doteasy mail server. Your domain email accounts are managed via your account cPanel. Click Manage Email Accounts. This will open your cPanel dashboard. 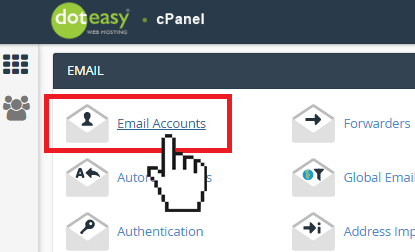 On the cPanel dashboard, click Email Accounts under the Email section. Create the email address(es) you need to setup on your Doteasy account. Make sure the new email account you are creating matches that of the existing email address you want to migrate to Doteasy. The next step is to archive your old email messages on your old host mail server. The easiest way to archive your email messages is to setup a POP3 connection using your email client. POP3 is designed to download every piece of email message from your server to your local computer. In other words, if you are using a POP3 connect, your emails are already downloaded onto your computer and there are not further steps you need to take to archive your emails from your old host. However, if you are using a IMAP connection, you will need to move your emails from your old host to your local computer. Again, the easiest way to do so is via a POP3 connection. Simply open up your email client and change the incoming mail protocol to POP3 with the correct server name and settings (you will need to contact your old host for the correct settings to use). Unfortunately, if you have a lot of email addresses, you will need to go through the process for each email account. Generally, we do not recommend you migrate existing email messages to your Doteasy email accounts – if you currently have a large number of email messages on your domain email account(s), moving them to your Doteasy account may result in exceeded email storage quota. The best way to save your existing email messages is to archive them onto your local computer using an email client, such as Outlook or Thunderbird. Open your email client and add your Doteasy email account. You will find your Doteasy mail server settings under View Email Client Info in your Doteasy Member Zone. Under the email address on your old host, highlight (or select) all the email messages you want to migrate to your Doteasy mail server. Copy the emails into the email address on your Doteasy server. The IMAP protocol will allow your Doteasy mail server to synchronize with your email client and the email messages will be saved on your Doteasy mail server. If your old host uses cPanel, we can help you transfer your entire domain email setup (including email accounts and filters). Simply contact us with your request along with the login information to your cPanel dashboard with your old host.